LANCASHIRE Constabulary has joined forces with the ground-breaking national anti-knife crime campaign ‘Save a Life, Surrender Your Knife’, as the force’s knife amnesty comes to an end. Since the amnesty began at the end of August, more than 800 knives have been handed in across the county – including swords, machetes and commando knives. The amnesty was extended for a further week owing to its success. Lancashire officers have now given their backing to a national initiative designed to raise awareness of knife crime and encourage the surrender of dangerous weapons. The British Ironwork Centre, which is coordinating the project, intends to use the collected knives to create a 20 feet high guardian angel sculpture in memory of those whose lives have so tragically been lost. Despite the amnesty ending this week, police say people can continue to hand in any knife at any police station with a front counter as well being able to drop them into the designated bins. Police are looking to keep the bins and extend the number of locations to include job centres, community centres and leisure centres. 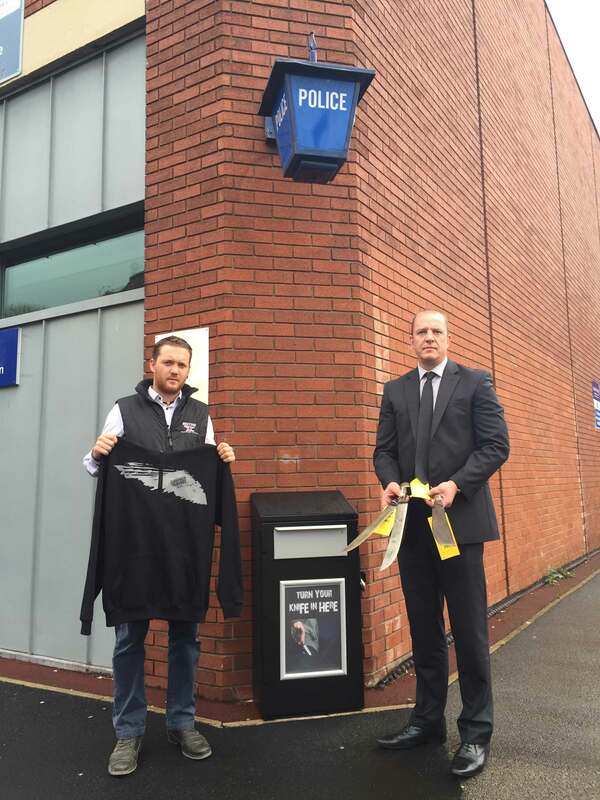 The “Save a Life, Surrender your Knife” campaign is creating and providing bespoke knife collection bins to be located in the cities around the UK. Detective Chief Inspector Steve Dowson said: “We are keen to raise awareness of the devastating impact of knife crime and to reduce the number of families affected so we have decided to keep the knife bins indefinitely. “While projects encouraging the surrender of knives are not a single solution to violence, they have an important role to play in inspiring communities to get behind education and preventative measures. “Such campaigns show a desire to address local concerns and Lancashire Police is keen to throw our weight behind them in support. In total, 340 knives have been handed in across Preston, Chorley, South Ribble and Skelmersdale. Blackpool, Wyre and Fylde, as well as North Lancashire, have seen a total of 150 weapons handed in, while 310 knives have been handed in in East Lancashire. Among the weapons given up are machetes, swords, axes, a homemade blade screwed together with razor blades and large knives. Clive Knowles, Chairman of the British Ironwork Centre, said: “The statue, which will represent the culmination of our project, will symbolise the nation’s stand against knife crime. We are delighted to be able to work in partnership with Lancashire Police in the on-going fight against knife crime”. The charity project is already gaining huge momentum, receiving the backing of growing number of families whose lives have been tragically affected by knife crime, and of Terry Waite during his recent visit to the Centre. The Lancashire knife amnesty, which started on Monday 25 August, officially ended on Monday 6th October 2014. Following the end of the amnesty all knives will continue be surrendered anonymously – no names will be taken, and there will be no CCTV cameras recording. The British Ironwork Centre is appealing for support with this campaign throughout the UK. If you’d like to find out more about volunteering opportunities available please contact them directly on: info@surrenderyourknife.co.uk. Filed Under: GANGS & KNIVES, What's new?